The Energy Observer is a specially adapted race boat that runs purely on hydrogen. It is set for a 6 year voyage and at the helm is Victorien Erussard, an offshore racer and merchant naval officer. Second in charge is Jérôme Delafosse, a professional driver and wildlife documentary producer. The French team are being backed by Toyota – a company already well versed in hydrogen technology. Hydrogen is the most abundant element in the universe, however most of it is tied to other atoms, like oxygen, creating H2O or water. The Energy Observer, of course, will have an endless supply of water from the sea – which it will ingest and demineralise (removal of salt and other minerals found in seawater) – but the process of splitting atoms, electrolysis, costs energy. 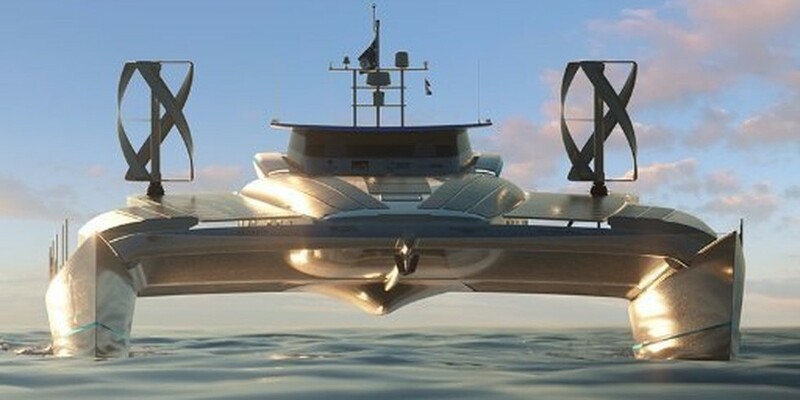 So, the Energy Observer performs this process onboard through the utilisation of 130 square meters of solar panels and two wind turbines, which can produce up to 23 kilowatts of energy. The hydrogen, once separated, needs to be compressed as it is a gas that takes up a large volume under normal atmospheric pressure. Using the renewable energy sources onboard, the Energy observer compresses the gas up to 700 times atmospheric pressure. The compressed gas is then mixed with oxygen, sparking a reaction that causes electrons to flow and create a current that powers 241 kilowatt electric motors. “When we are over-producing energy, when we have a lot of wind and sun, the idea was not to waste this energy and to just keep it onboard. Hydrogen is the best way to do this because it’s very light and the efficiency of hydrogen is three times more than just fuel,” said Jerome Delafosse. The only pollution the ship leaves behind is pure water. Hydrogen is also a relatively safe fuel to use. Because it’s so light, if the tank it’s compressed in is suddenly ruptured, the gas will escape to atmospheric pressure so fast that there’s no chance for it to ignite.
? Why You Should Choose Your Friends Carefully China May be Uninhabitable by 2100 Due to Deadly Heat Waves ?